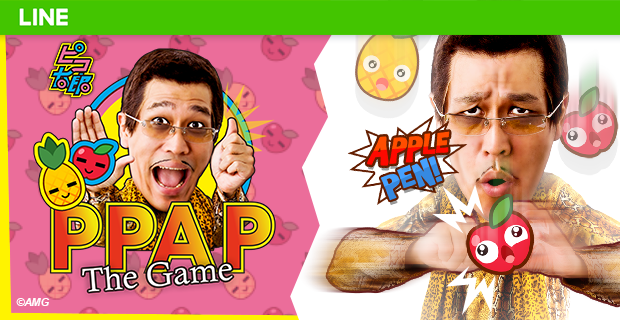 AMSTERDAM/TOKYO, December 20, 2016 – CoolGames today released ‘LINE: PPAP The Game’ for the LINE messenger platform. The game is based on the YouTube super hit “Pen-Pineapple-Apple-Pen” of Pikotaro, a mysterious Japanese singer and songwriter. Its unique rhythm and addictive lyrics have grabbed the attention of millions of people worldwide. Since the video’s YouTube release on August 25, it has been played more than 100 million times and reached No. 1 position on the YouTube charts for 30th September – 6th October 2016. Also, the PPAP themed sticker-set currently ranks as the most downloaded content in the LINE sticker shop. In cooperation with LINE and Avex Management, CoolGames has now created a fun action game that can be played directly within the LINE messaging app. Goal of the game is to stab a pen in as many apples and pineapples that are falling down as possible. Scores can be shared and compared directly with your friends on LINE. It is the first game for LINE that is fully based on HTML5 technology and can be played directly, without the need to download a separate app first. Laurens Rutten, founder and CEO of CoolGames, said: “With the diminishing of Flash, and various social networks now embracing web-technology, we are proud that we can bring this HTML5 game to the many users of the LINE platform”. Any LINE user across the globe can play the game after becoming a friend of the Pikotaro official account. CoolGames publishes some of the best performing HTML5 games via hundreds of distribution channels worldwide, including many leading game websites, social networks and media brands.